We try our best to make sure that all our guests have comfortable facilities. All requests are dealt with efficiently because we want you to feel welcomed throughout your stay. The inn has seven en suite bedrooms, each with colour television, telephone, tea and coffee tray and hair drier. In selecting your bedroom, you can choose to overlook the river at the front of the house, or the green fields backed by the mountains at the rear of the house. Besides the dining-room, there is a large lounge with an open fire and two attractive small bars. 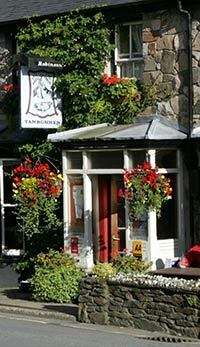 The Tanronnen has long held a reputation for its high standard of cuisine and the homely and cosy atmosphere. Packed lunches are provided on request. The inn is open all year round and the dining-room is open to non-residents. Please read our accessibility page for more specific information on access and facilities.